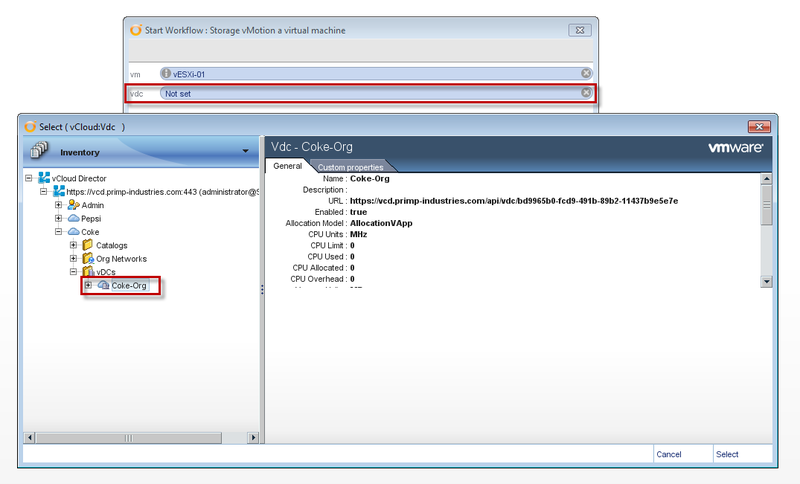 I wrote an article yesterday called Performing A Storage vMotion in vCloud Director Using vCloud REST API and at the beginning I mentioned a few alternative solution to using the vCloud REST API such as the vCloud SDKs: Java, .NET, PHP or the new vCloud Director cmdlets. Afterwards, I realized I left out one very important solution, which is using vCenter Orchestrator (vCO) with the vCloud Director plugin. 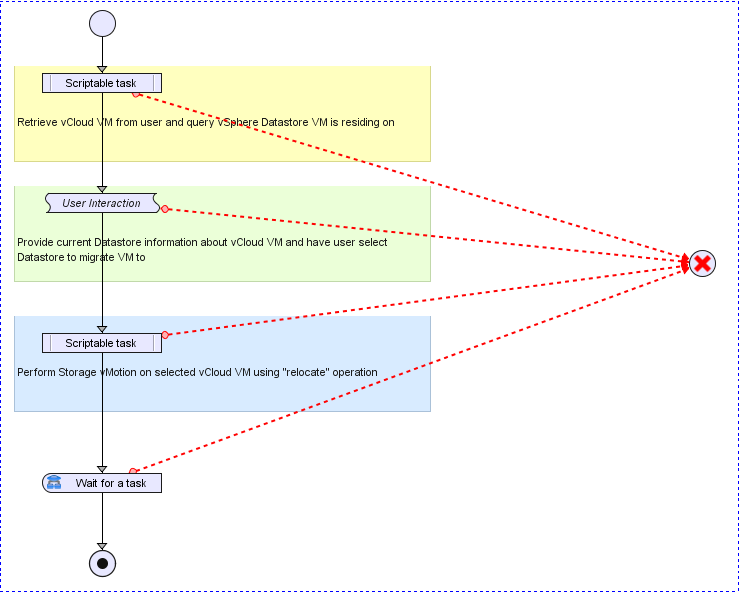 I was able to quickly put together a vCO workflow using the Query Service in the vCD plugin and with the help of this VMTN thread from Christophe Decanni. I have exported my workflow so you can easily import it into your vCO Server without any hassle. Disclaimer: Please thoroughly test this in a non-critical environment before using it on production systems. 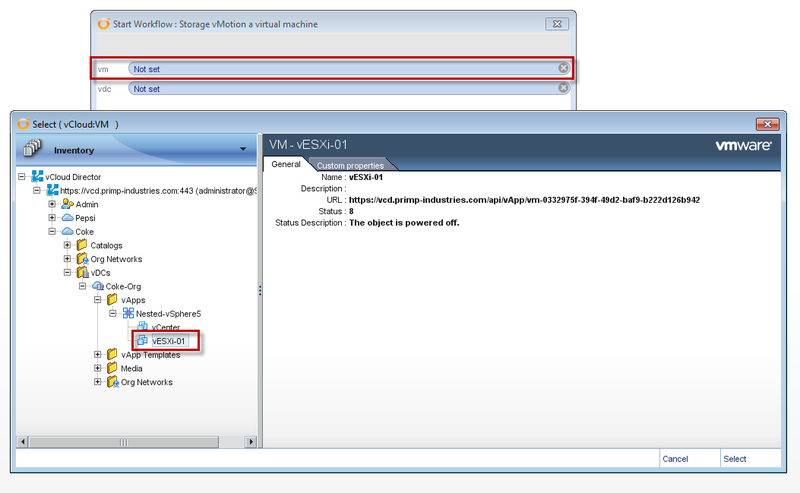 Here is an example execution of the workflow where we will Storage vMotion (using vCloud "relocate" API operation) to move "vESXi-01" VM from "iSCSI-3" to "iSCSI-4" datastore. 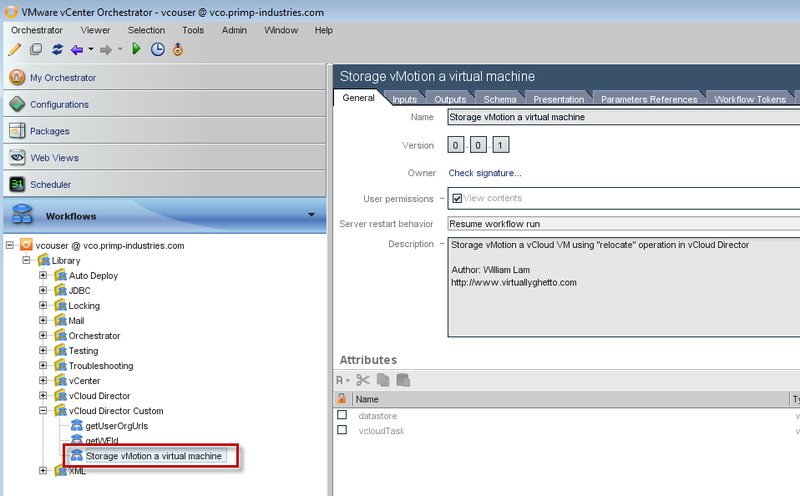 Step 4 - Now you are ready to kick off the Storage vMotion operation. This may take sometime to finish depending on the size of the VM and the speed of your underlying storage. You should see a message under "Log" specifying the operation has been started. 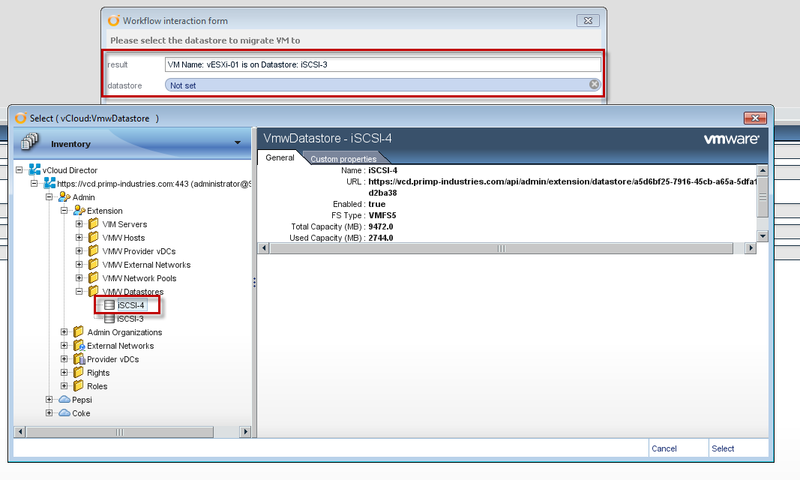 If everything is successful, you should see the vCloud VM now running on the new datastore. To move a template to a different datastore I just rightklicked the template and said “move to a different catalog”, there I selected the same as before. It seems to work so far, but I did not have any linked clones of that maschine, don’t know if this could have any side effect. Sounds good, but download doesn’t work: Cannot resolve hostname!?!? Sorry about that, link fixed. 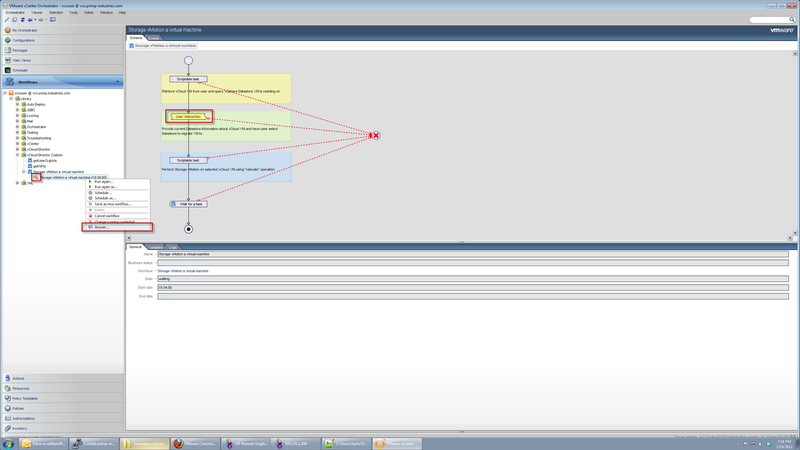 No, you just import the workflow into vCO. Your ZIP consist of 3 files. When I try to import either of the files to vCo does not work: “Unable to import file * Not a valid workflow file”. The extension as noted in the link should be .workflow, please don’t try to save it as anything else. Within the .workflow, there will be several files but that’s more of the internals of it which you don’t need to touch. When you export a workflow, it’ll have a .workflow extension & you can just import it right in.